Contrary to what you might think after looking at my last few reviews, I am not generally a fan of sequels. Broadly speaking, since characters have already been introduced and established in the first film, unplanned sequels can take on a watered-down sort of flavor and plots can seem a little...thrown-together. And while Finding Dory ends up being a pretty good movie, the film doesn't shake this thrown-together feel until you're about halfway through. The plot follows Dory a year after she and Marlin have (spoiler alert) found Nemo. After her memory gets jogged by something random, she remembers her parents and goes on a quest to Morro Bay, California to find them. On the way, she gets separated from Marlin and Nemo, and has to make her own way while Marlin and Nemo try to (wait for it) find Dory. On the way, she meets a bunch of new characters, remembering things that she hasn't been able to recall in years. First of all, I'd like to commend Pixar on once again ripping my goddamn heart out. Between Baby Dory's sweet little baby angel voice (WHICH KILLED ME), the fact that she's lost her parents at the age of like 3 years old, and the fact that they keep having to run around in circles all around this damn place trying to find everyone -- I may be overly sensitive but this movie killed me. It's not like Pixar is ever coy with breaking your heart, but good lord. 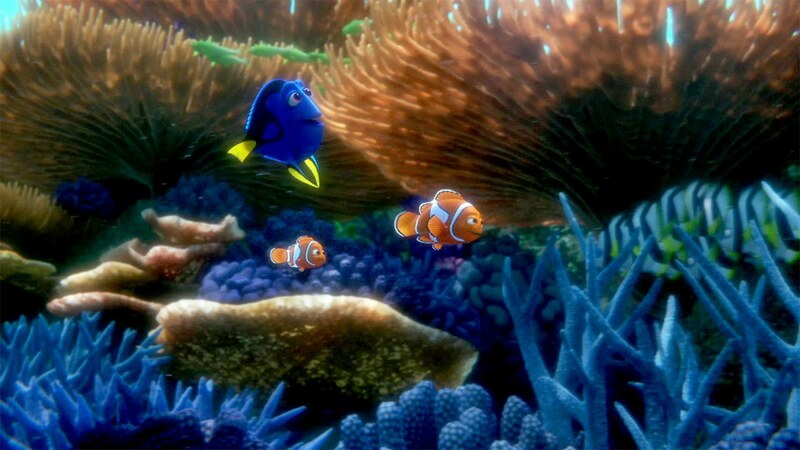 They just spent an entire movie trying to find Marlin's son, and now they've gotta break our hearts all over again as they try and figure out how Marlin and Nemo can find Dory. It's too much, Pixar. Can we have some sunshine and rainbows next time please? Kthanks. Alright, back into adult critic mode. Good things: this is not Pixar's first rodeo. While I may just be overly emotional, the fact that I cried at a forgetful baby fish with giant eyes only proves that Pixar is a veritable wizard at playing people's emotions. This is a very heartfelt tale of someone trying to reconnect to their roots and to find a portion of their past. It's extremely poignant, especially the ending, without being sappy, and funny without being cheap. And of course it's a masterpiece of computer animation as all Pixar films are (how they get the ocean to look 100% real is beyond me). All told, it's a well-made film, if not the masterpiece that is Finding Nemo. It's not you, it's your predecessor. Now the things that bugged me: in terms of flow, the movie reads a little wonky. The first half is so jumpstarted that it's a little bewildering. Not even ten minutes after getting a first glimpse of her original life with her parents, we're thrust back into the "present" for about five minutes only to then be thrust right back into the past as Dory begins to remember things.A few jump-cuts later and we're already in Morro Bay. After about 45 minutes in, the movie finally finds its pace and the audience can settle in, but the first third of the movie is so bewilderingly jumpy in contrast to the meandering adventure of the first...it's just a little jarring. Also, this movie has a totally different vibe than Nemo. Since this movie is told largely through Dory's eyes, there's also an underlying anxiety in this sequel that isn't present in the first. In the first one at least she has a chaperone to help her out. And while a lot of this movie is about her being able to navigate her own way as an adult with a disability, it creates so much tension that the movie ends up being a lot more on-edge than its predecessor. Far from being a determined rescue adventure with a set destination, most of the movie is spent with each character running around in circles as they keep on missing each other by inches. And with Dory's shaky memory plopped on top of that exasperating run-around, it's a wonder that anyone finds anyone. LISTEN TO SWEET BABY DORY FISH'S VOICE IN THIS TRAILER. Nice review. I love baby Dory. Great review, baby Dory killed me too. She was so cute! I really enjoyed this film. I didn't expect to because Finding Nemo was so close to perfect, but this nearly is too.